Cycles for Heroes sent me one of their MO’s Mallets a couple months ago. I am very late doing a post about it. But in that time I have been playing games with the mallet every week. I have never made a mallet this nice. I kind of wish I had about eight of them to take to tourneys. I like making mallets, I’ve been doing it for years but there are two things I liked a lot about this mallet from the get go. One, it’s light. Two, it’s very well made. After weeks of pick-up games the HDPE mallet head has worn very well. It still has lots of life in it! Also it does keep it’s shape even after some heavy hits against it. A couple of things that I want to mention in the room-for-improvement department are that you need two 3mm keys to tighten the rod that holds the head on. With just one the whole thing will just spin because all the threads are internal. Over all this is a good thing but just a heads up to have two 3mm’s on hand to tighten loose hardware. 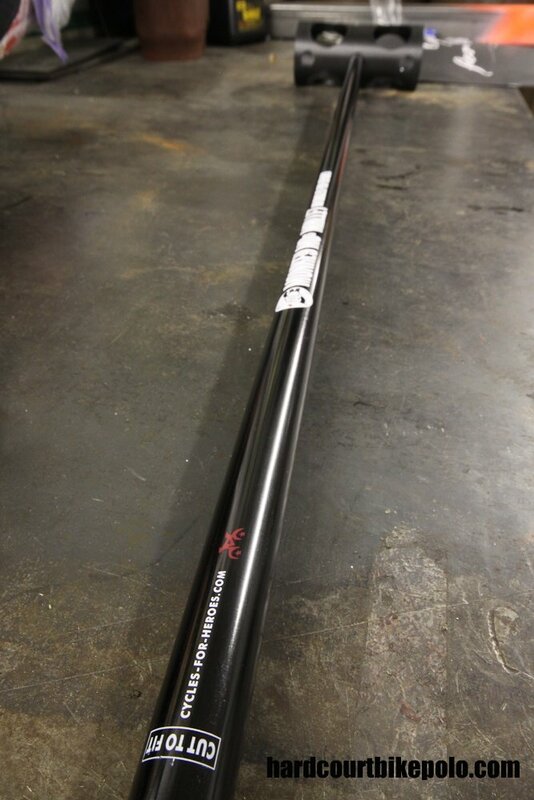 And the second thing that might be more important is that after a couple weeks the rod that goes through the AL7075-T6 seamless shaft did bend. Nothing too severe, it’s still holding strong, just bent a little. I think it’s made of aluminum. Something stronger might be ok because this mallet is very light and another ounce would not kill it. All the lightening holes are well placed and have not shown any weakness. The whole thing looks good. It’s super easy to put together. The over all length is a bit long so it’s no big deal to trim it to size, plug the end, wrap it however you like and it’s good to go. There are a few places to get poles, and or mallet heads. But as far as I know this is the first and only place to buy a complete mallet. And as I said before and to anyone at pick-up who asked. I like this mallet a lot. Looks good, built well, plays great. Not much more to ask for. Well, I might ask for a capped end. And someplace in North America to get them from but other than that you can’t do much better for a pre-made complete mallet. 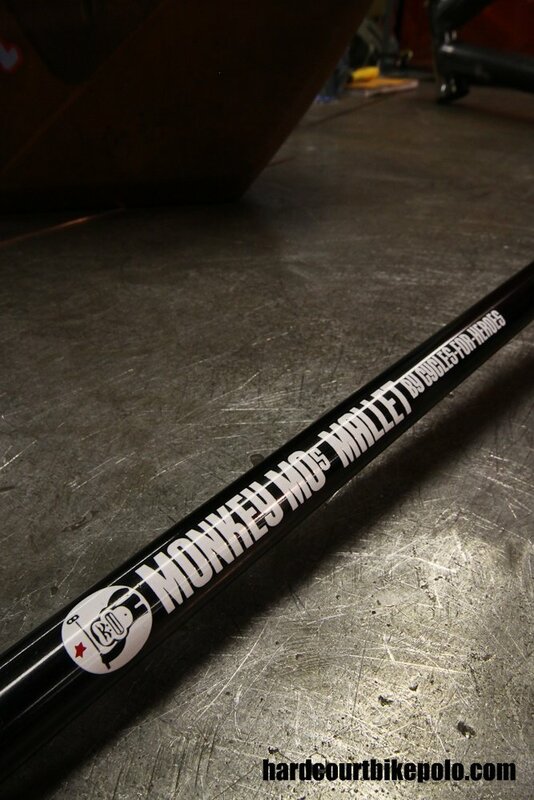 This entry was posted by Doug D on May 9, 2010 at 11:00 pm, and is filled under Bike Polo, Germany, Photos, Products. Follow any responses to this post through RSS 2.0. You can leave a response or trackback from your own site. Hey Doug. Have you played the MKE shafts? How do these compare? Both are 7075, and I’ve heard the MKE shafts are a bit thicker wall than then Mo’s. Matt, I have. I built one with my own head. It’s good, it’s strong, but it’s not light. I have a couple of Mo’s Mallets too, and I love their weight indeed, but find the shaft very fragile. Surprisingly haven’t broken one yet, they just bend gracefully and it’s not too hard to put them back in shape. I haven’t played with a Mo, but a few people over here have broken them fairly quickly. We’ve got a batch of MKE’s coming soon, so we’ll see. 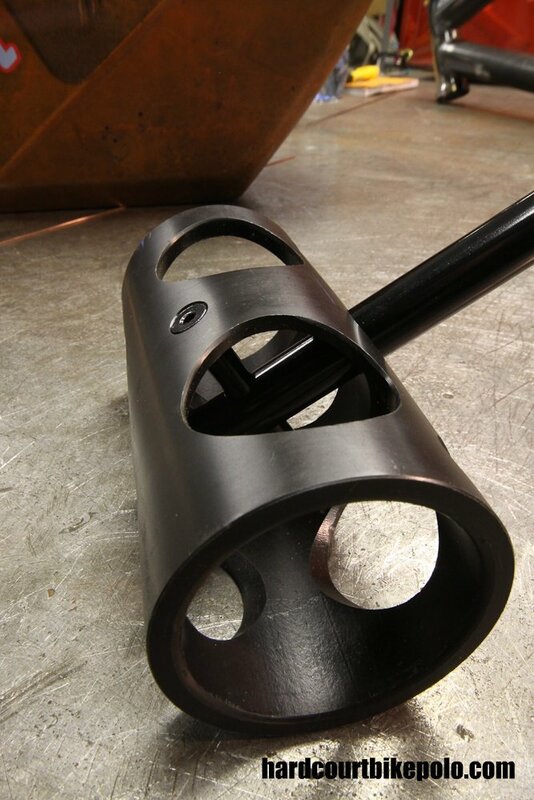 Update: The MKE shafts with HDPE 17 (thin black) are about 5 grams heavier than the Mo mallets. From memory, I think the weights were 220 and 225g. The balance on the MKE shafts feels amazing.